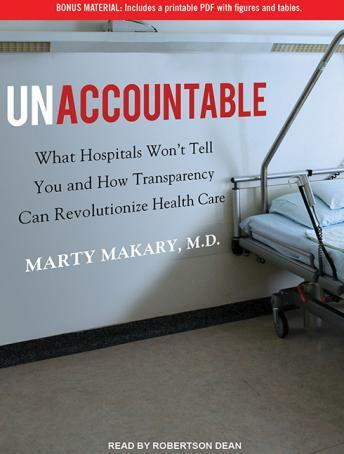 Written By: Marty Makary, M.D. Dr. Marty Makary is codeveloper of the life-saving checklist outlined in Atul Gawande's bestselling The Checklist Manifesto. As a busy surgeon who has worked in many of the best hospitals in the nation, he can testify to the amazing power of modern medicine to cure. But he's also been a witness to a medical culture that routinely leaves surgical sponges inside patients, amputates the wrong limbs, and overdoses children because of sloppy handwriting. Over the last ten years, neither error rates nor costs have come down, despite scientific progress and efforts to curb expenses. Why? To patients, the healthcare system is a black box. Doctors and hospitals are unaccountable, and the lack of transparency leaves both bad doctors and systemic flaws unchecked. Patients need to know more of what healthcare workers know, so they can make informed choices. Accountability in healthcare would expose dangerous doctors, reward good performance, and force positive change nationally, using the power of the free market. Unaccountable is a powerful, no-nonsense, non-partisan diagnosis for healing our hospitals and reforming our broken healthcare system.